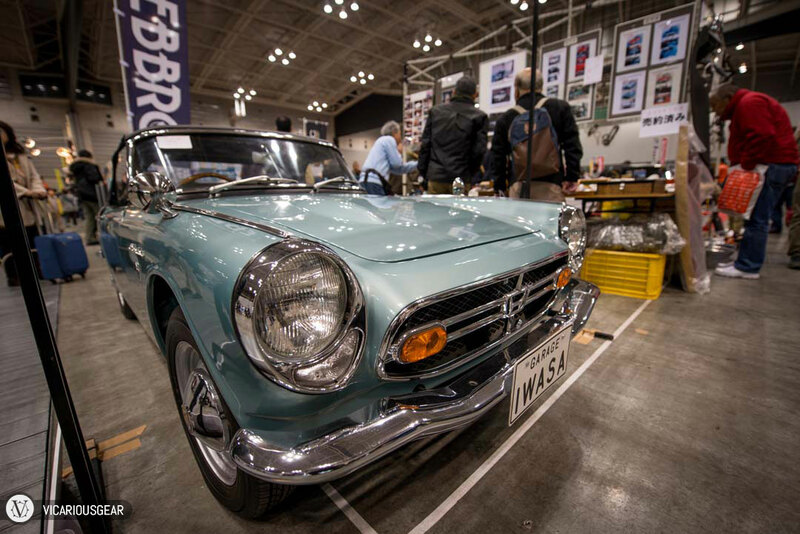 A couple of weeks ago I convinced Mimi to come along with me to the Nostalgic 2 Days (ノスタルジック２デイズ) car show. I missed it last year so I made sure to attend in 2014. 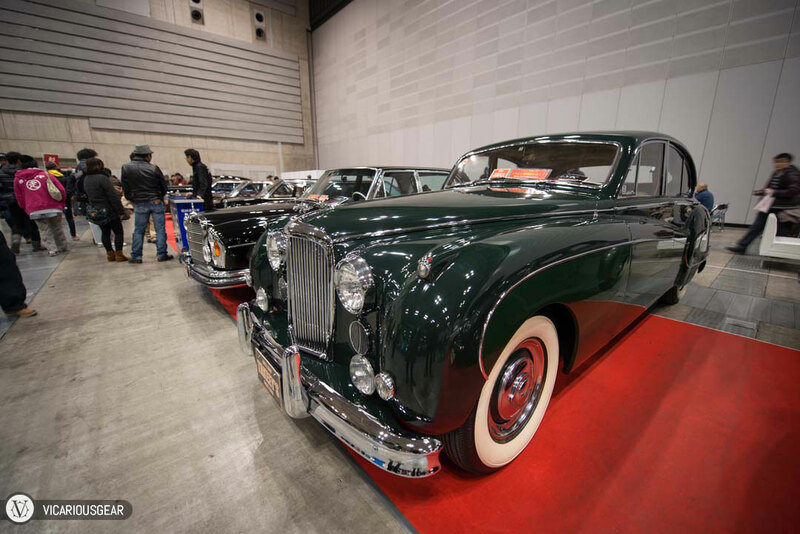 Based in the Pacifico Yokohama Convention Center, it is a somewhat small but quality packed event for vintage car enthusiasts. Definitely worth a visit. Somehow, I escaped without buying anything other than the Nostalgic 2 Days branded Hakosuka die-cast model. The entry price of 1800 yen (advanced purchase) includes a 500 yen voucher so its pretty cheap to check out the show. One thing to watch out for is the expensive parking in the surrounding area if you don’t arrive in time to park in the Pacifico garage. They had a pretty nice entry setup. 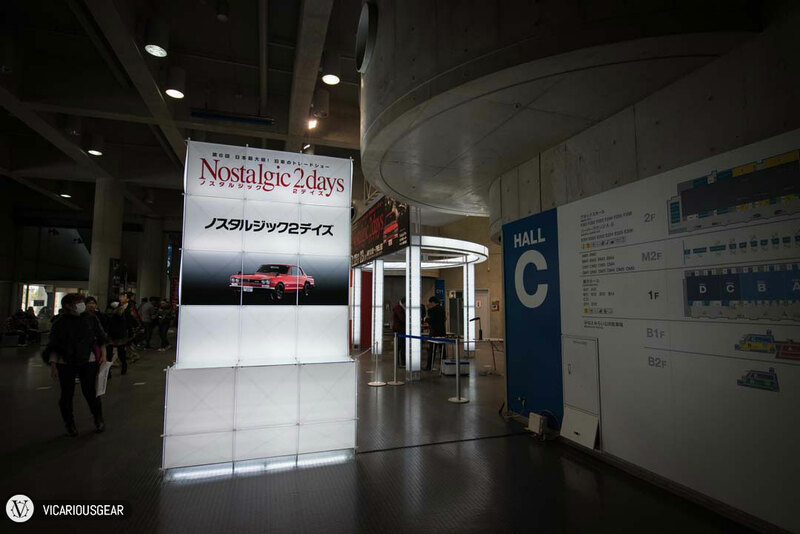 The show and vintage parts sales only occupied halls C and D. In hall A there was a robot football tournament. 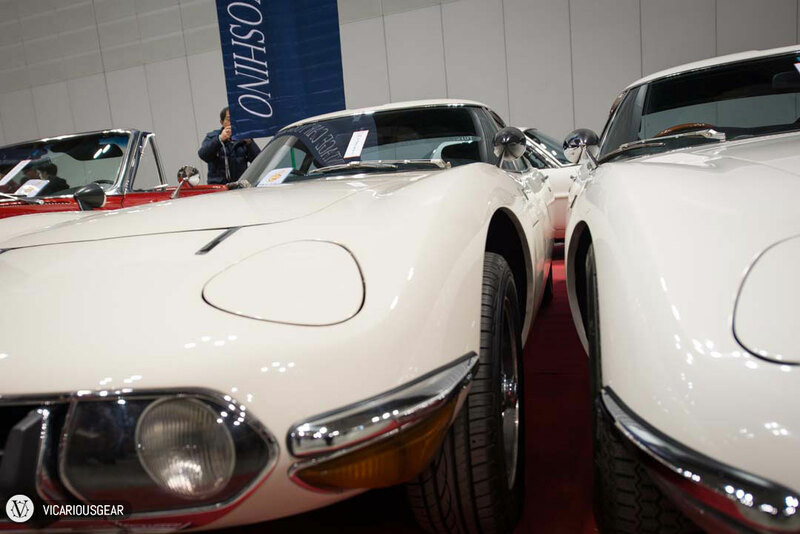 We were greeted by 2 examples of the extremely desireable Toyota 2000GT immediately upon entry. 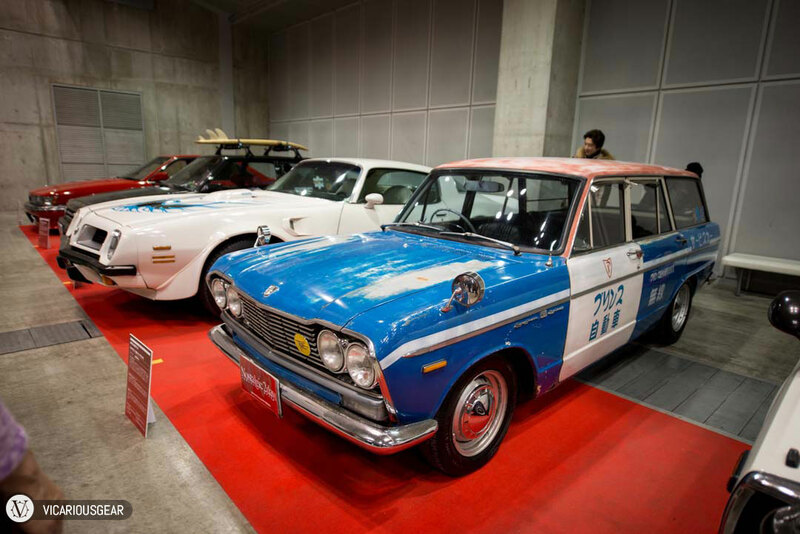 Vintage Car Yoshino has had these for quite a while. With the recent auction values up to 1.16 million USD you would think that a little more parking space would be justified. 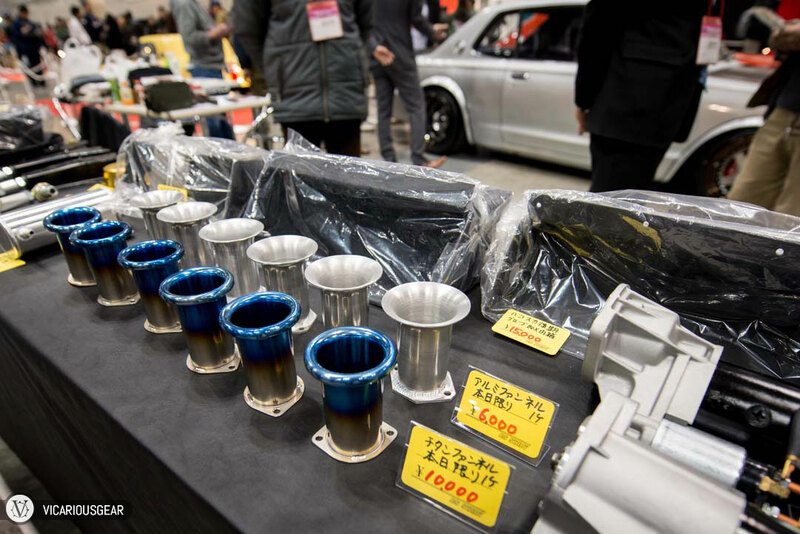 Aside from the 2000GTs, Vintage Car Yoshino also had an interesting parts booth. 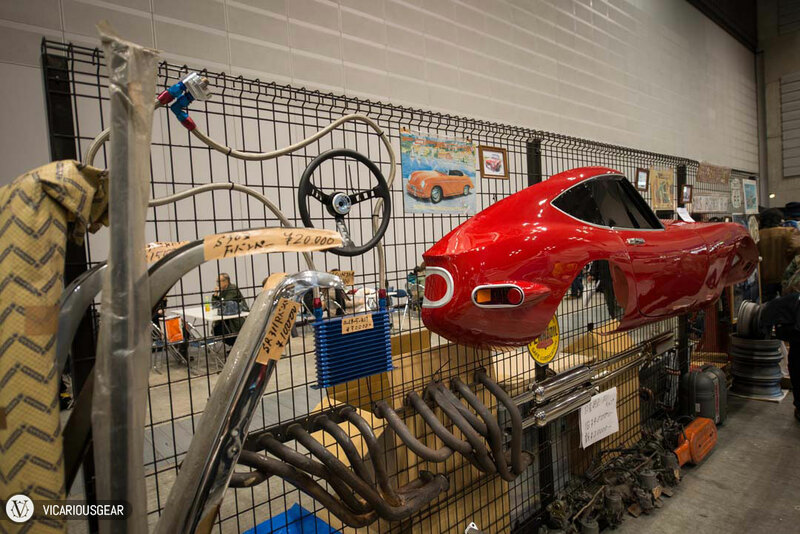 The fiberglass replica body shell would look great on my wall. Across the aisle was Star Road. One of my favorite tuners/restorers. 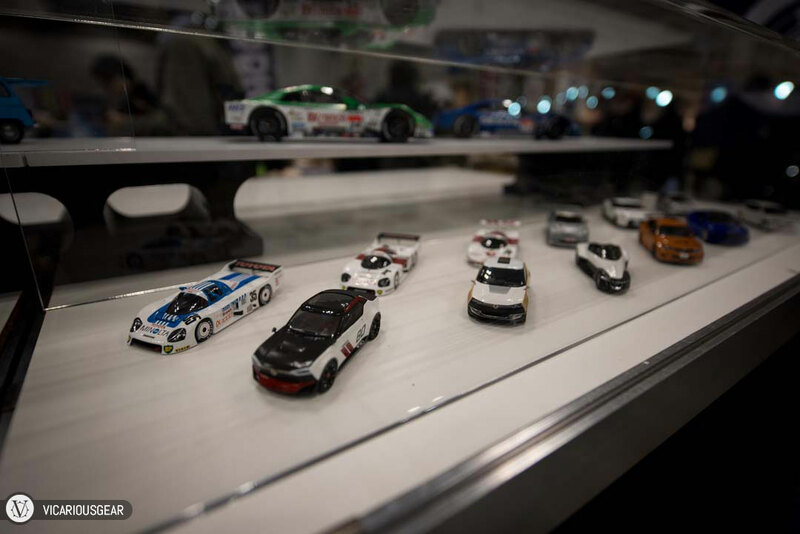 Their display cars are always immaculate. 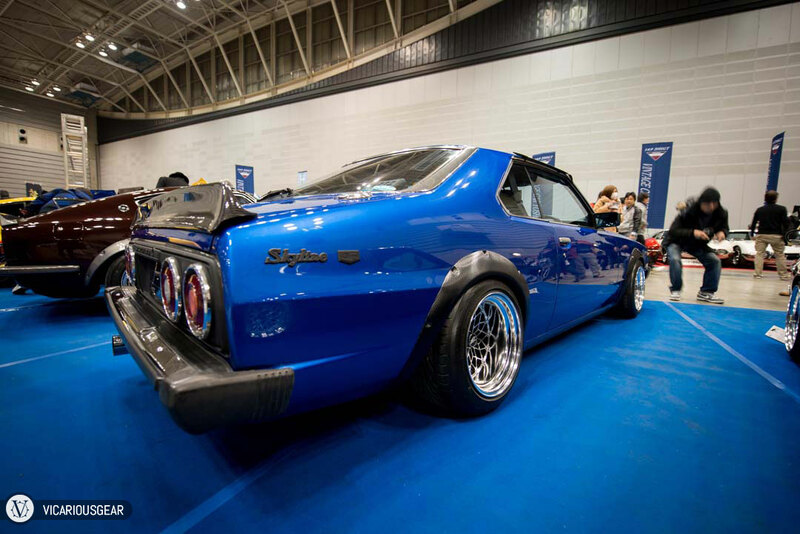 Mimi and I like the blue on this Skyline Japan. 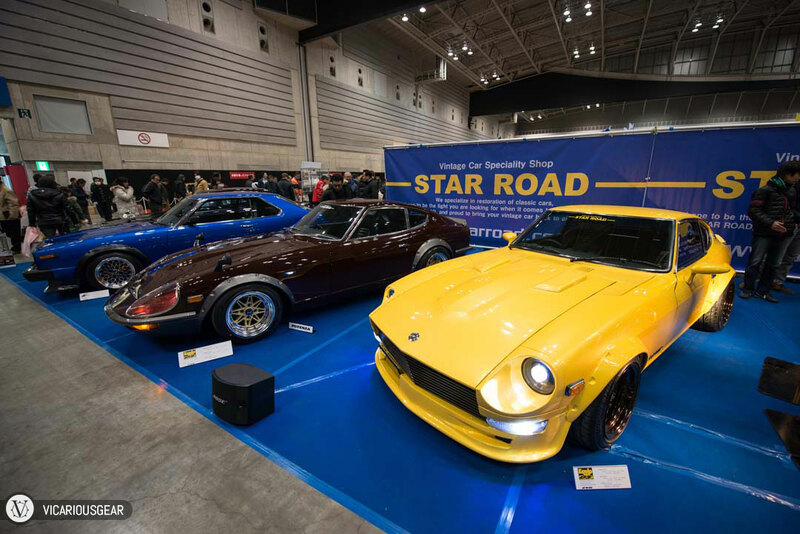 Nice Fairlady ZG on Work Equip 03 wheels. I was surprised the car wasn’t sporting the new Star Road Glowstar wheels. 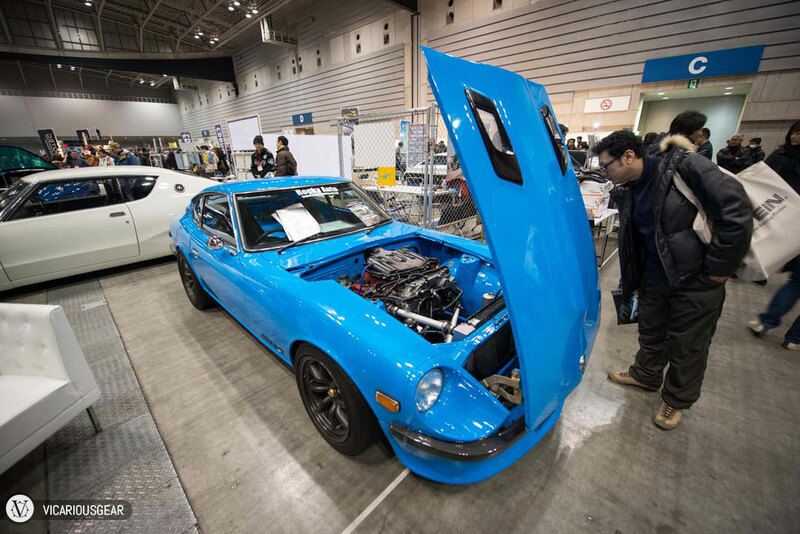 The engine bay of Star Road’s famous blue Zed. 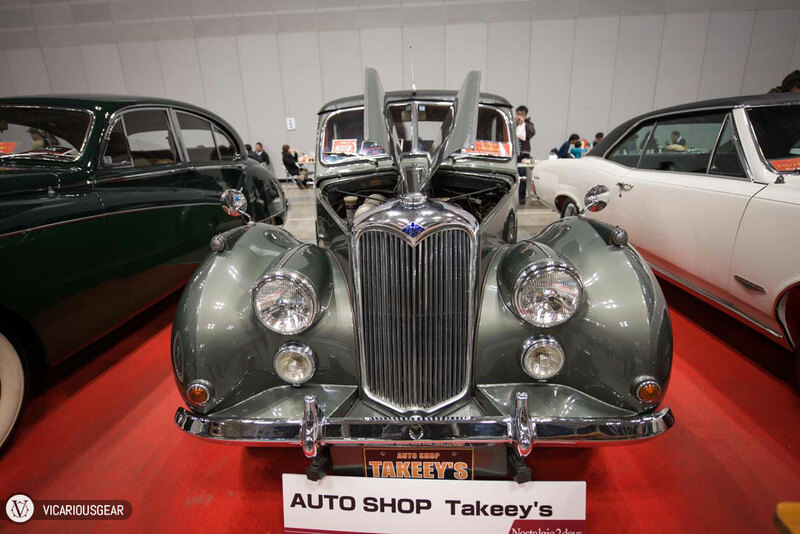 Next up was Auto Shop Takeeys. I was excited to finally see some of their stock in person because their listings always seem to have reasonable prices compared to other dealers. 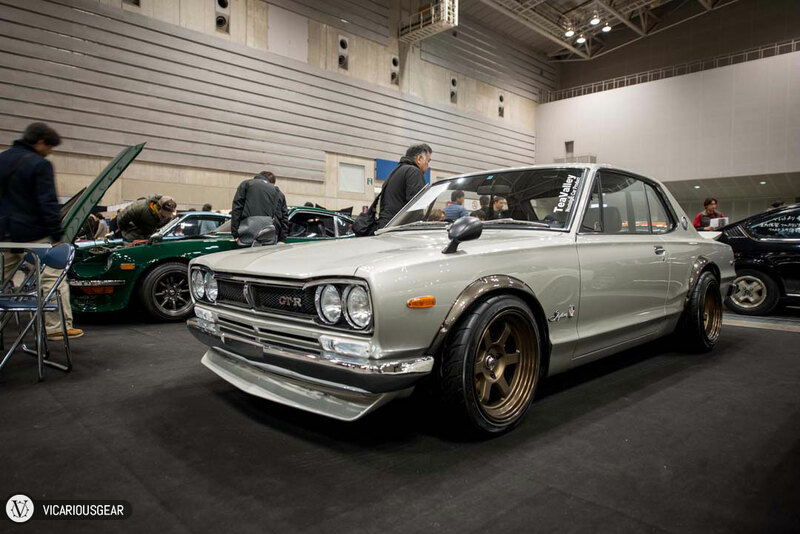 This works inspired Hakosuka Skyline was in pretty nice shape. This Riley RME was definitely a surprise. Yours for 40K USD with 0-60mph in 30 seconds! The car was pretty much spotless though. 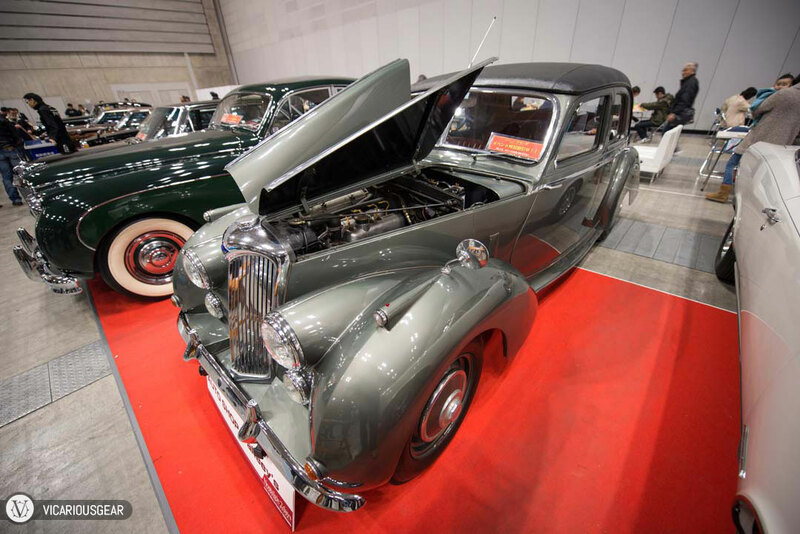 This Jaguar Mark IV sitting next to the Riley was gigantic. Comparable to a modern Rolls Royce phantom. There was a bit of American muscle on hand too. 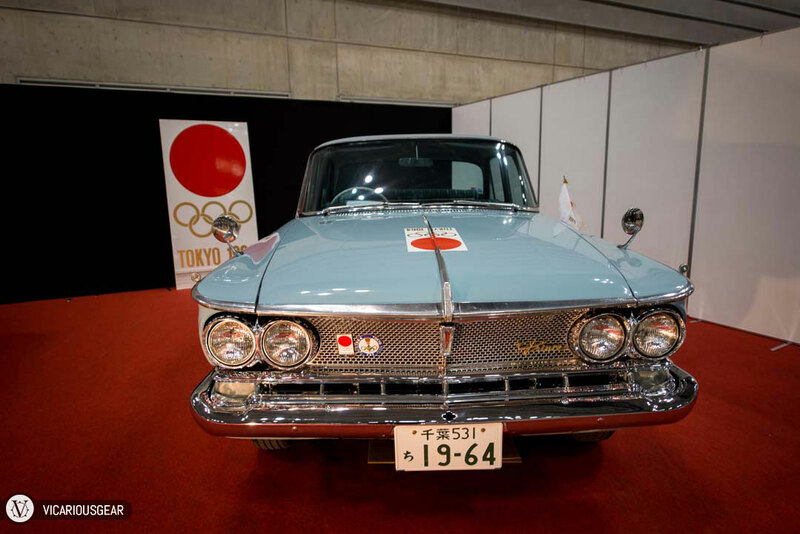 The black Toyopet Crown reminded me of the Tri-Five Chevys. 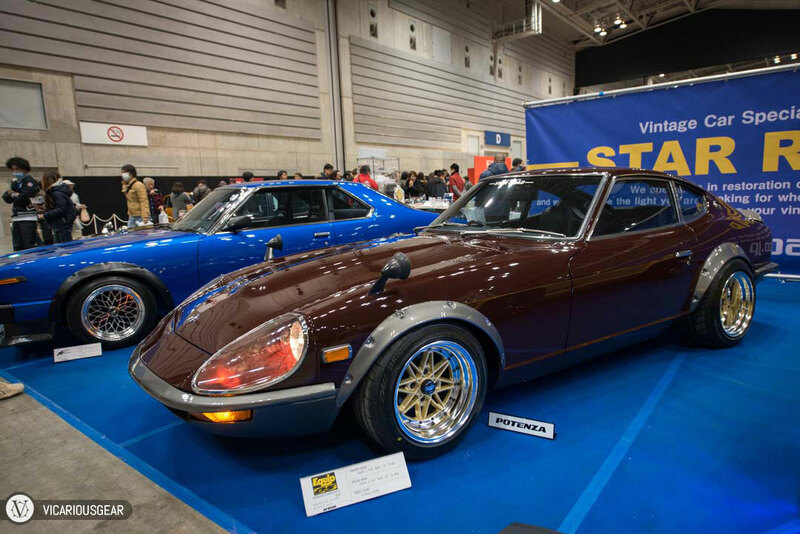 Moving back to the restomod scene, Rocky Auto had this S30Z with a VQ swap. 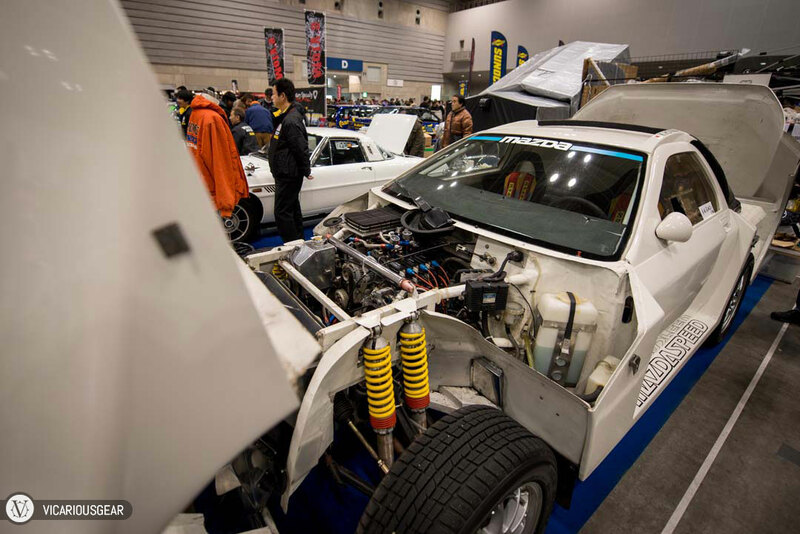 The car was a bit rough and the engine looked a bit small in the engine bay. I love their swaps and ideas, but overall, a ton of details overlooked for the amount of money they are asking. 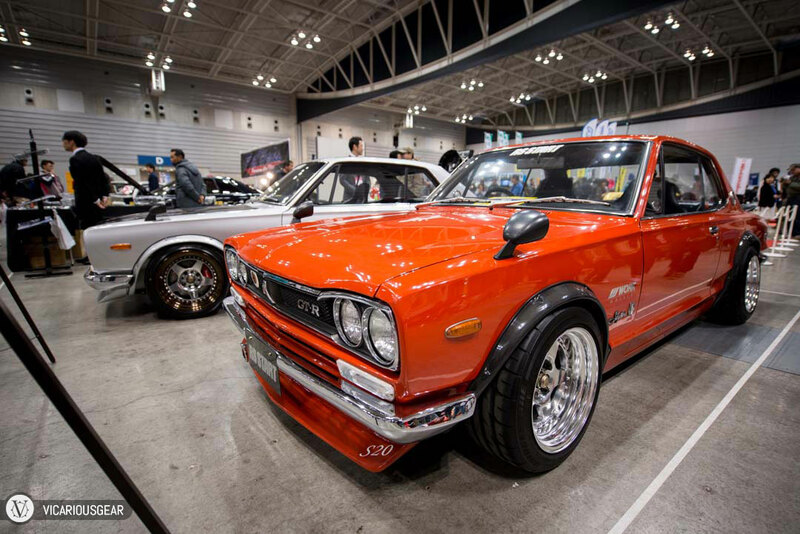 However, it was still great to see the Rocky Auto Kenmeri bodied R32 in person! 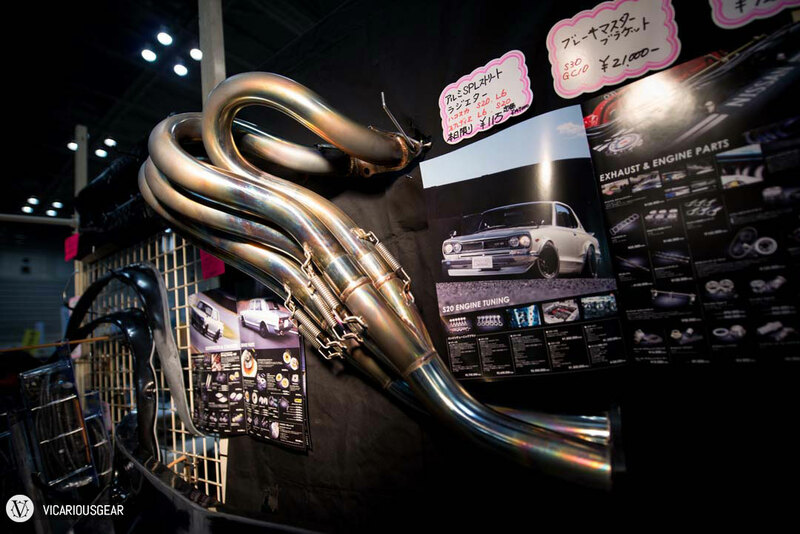 I would love an RB26 with Keihin FCR carbs in my Hako. 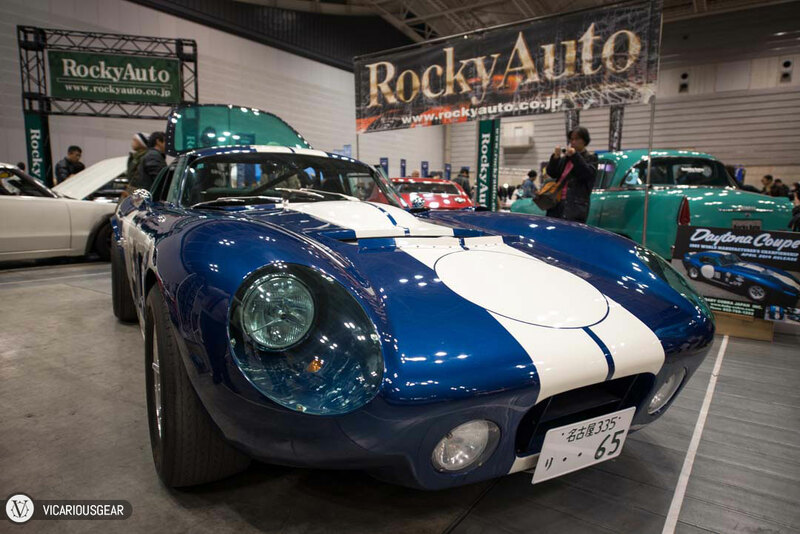 A big surprise in the RA booth was this Factory Five Type 65 Coupe. 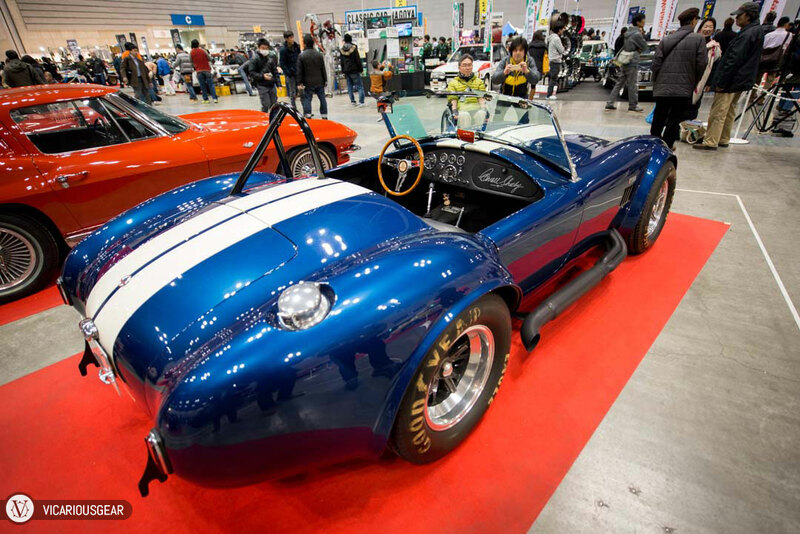 Based on the Shelby Coupe, the lines of this kit car were simply stunning. Mimi agreed, and I caught her returning to it for more pictures while I was looking at more mundane machinery. The finishing details on this car were nicely considered. Aside from the great condition of this Bluebird (510) coupe, it had something else near and dear to my heart. 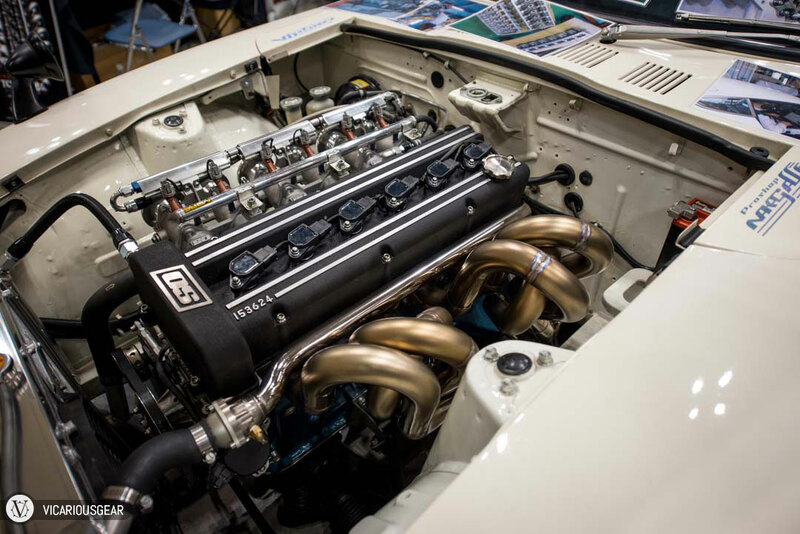 An F20C engine swap from a Honda S2000. 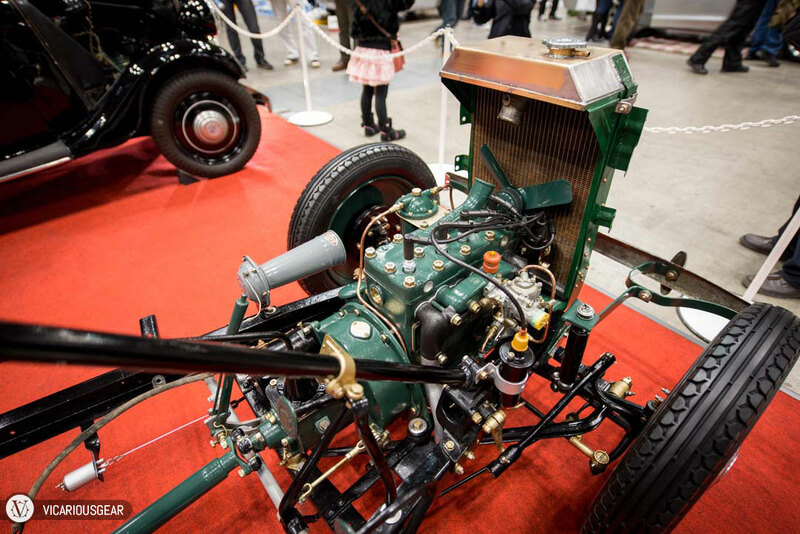 With the low curb weight paired to the modern high revving drivetrain, this car must be a blast to drive. 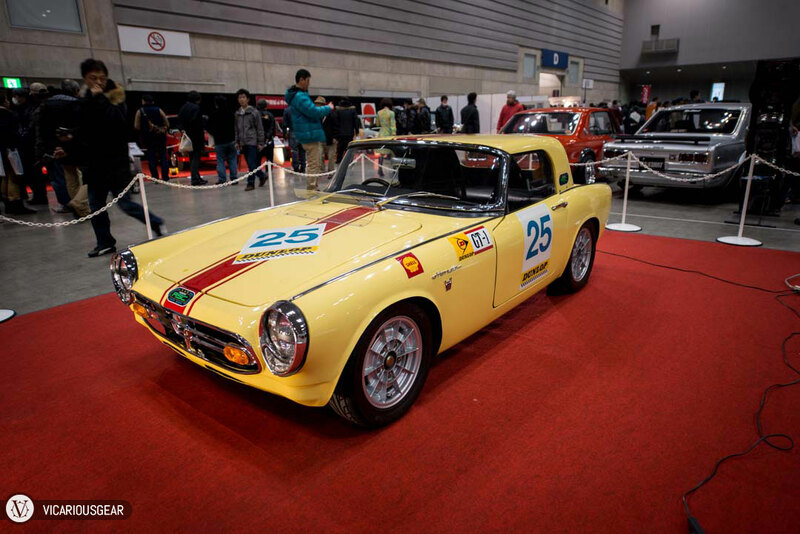 Speaking of the S2000, A few of its predecessors were attending the show. 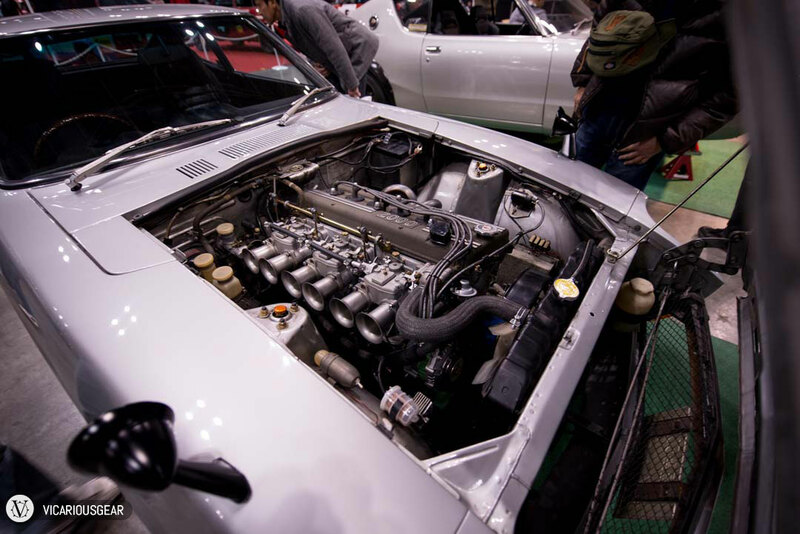 The engine bay of an authentic Z432. My first time seeing one. 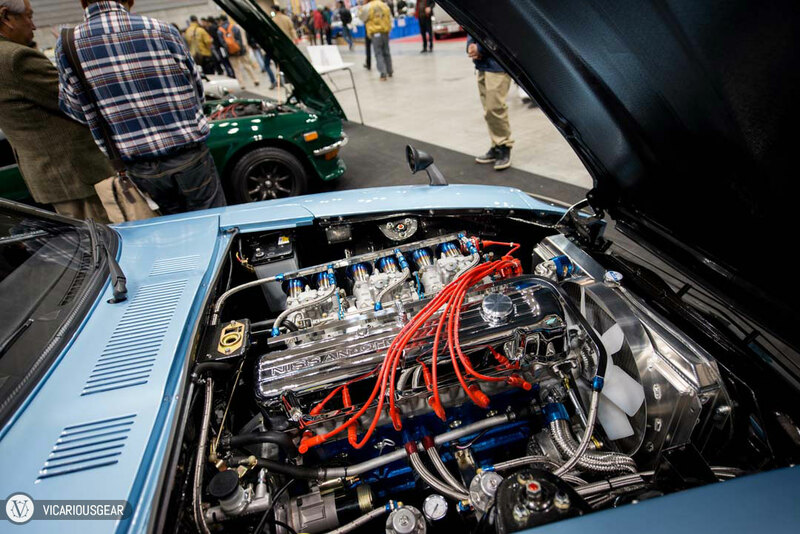 As for exotic engine bays, OS Giken was on hand to fill the need of any deep pocketed attendees. 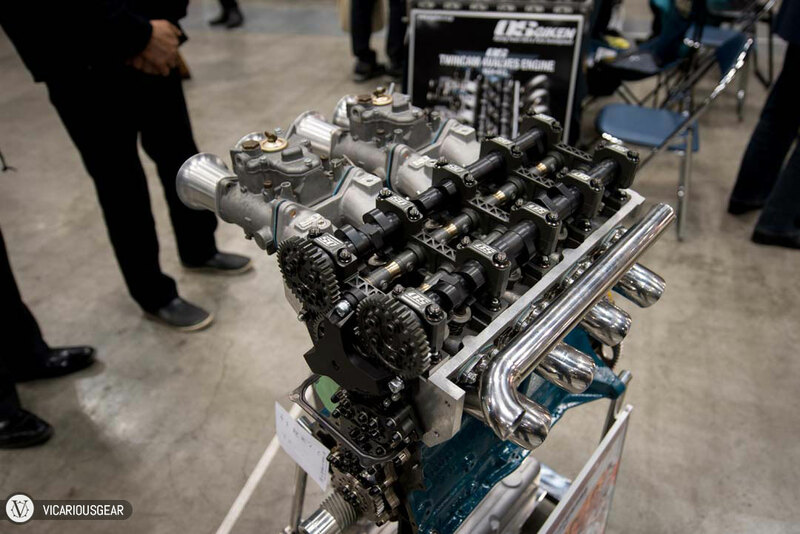 Their demo car with the TC24-B1Z crossflow head had me drooling. 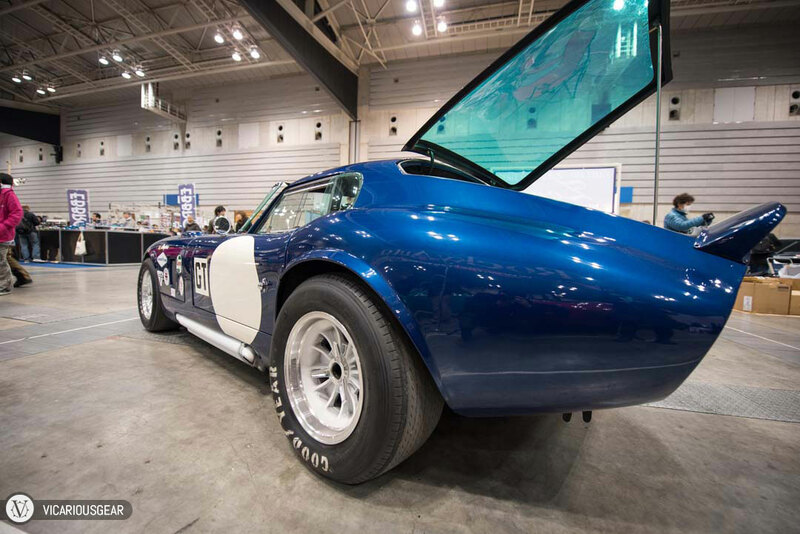 Fuel injection, twin cams and a stratospheric rev limit? Where do I sign? 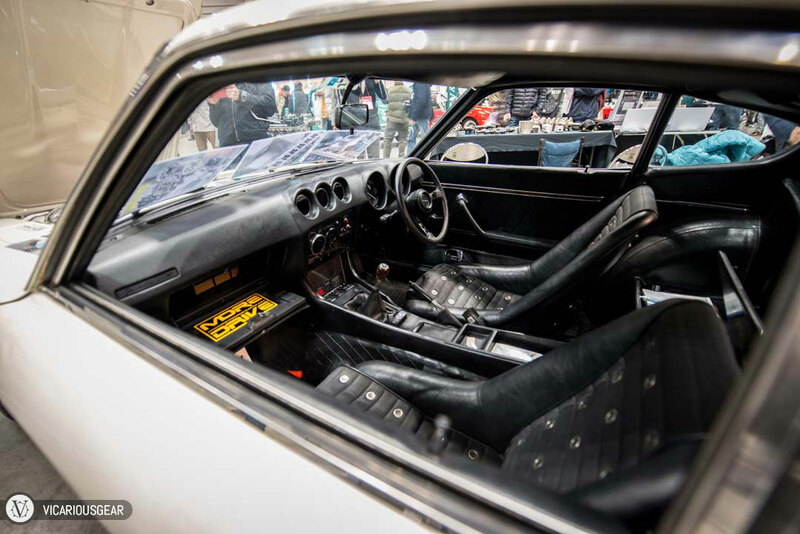 The interior was pretty good too. The aforementioned Z numbed me to the presence of this genuine Hako GT-R. But reality hit me when I strolled past this vendor’s parts display. 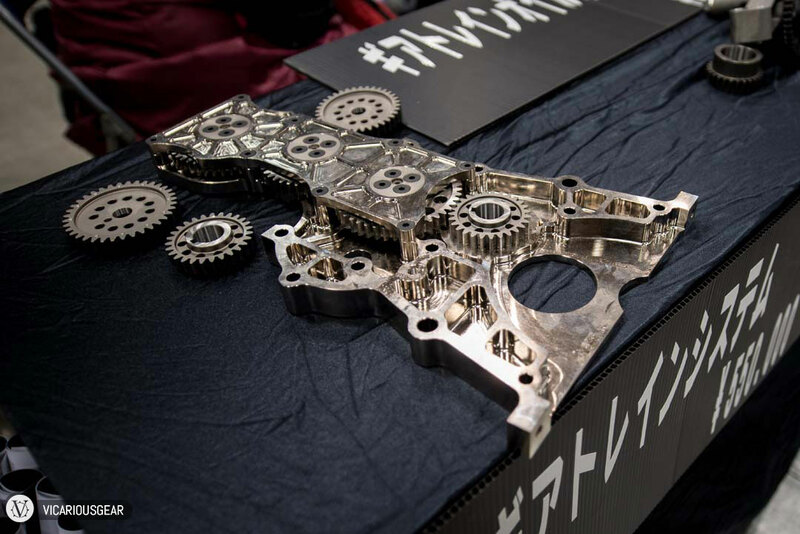 The S20 chain to gear timing conversion was finished like the inside of a fine watch and with pricing to match (About 5,000 USD). 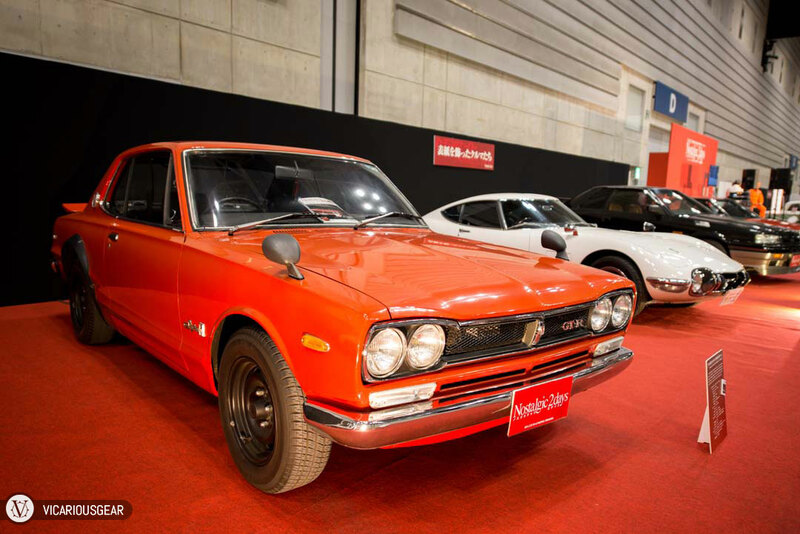 A nostalgic vintage show just wouldn’t be complete without a Prince Skyline. Of course the banner car for the year was on display as well. 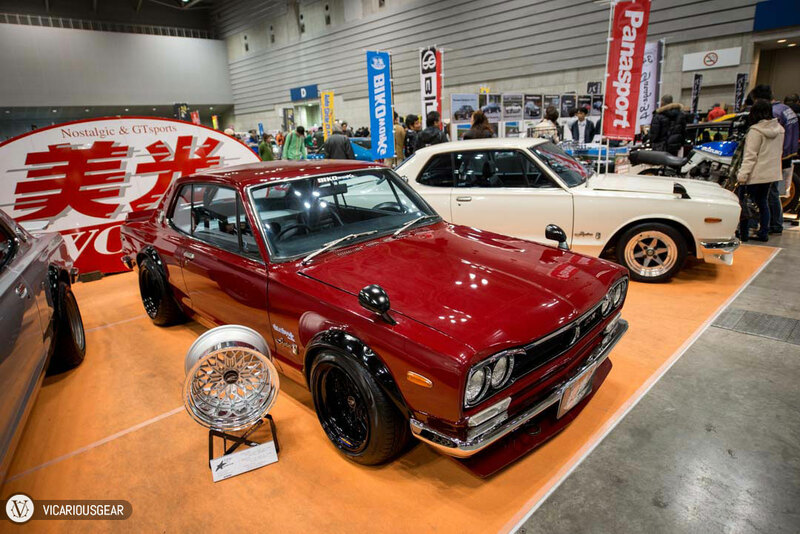 Every time I see a Hako in red I run the numbers for a full paint respray through my head. 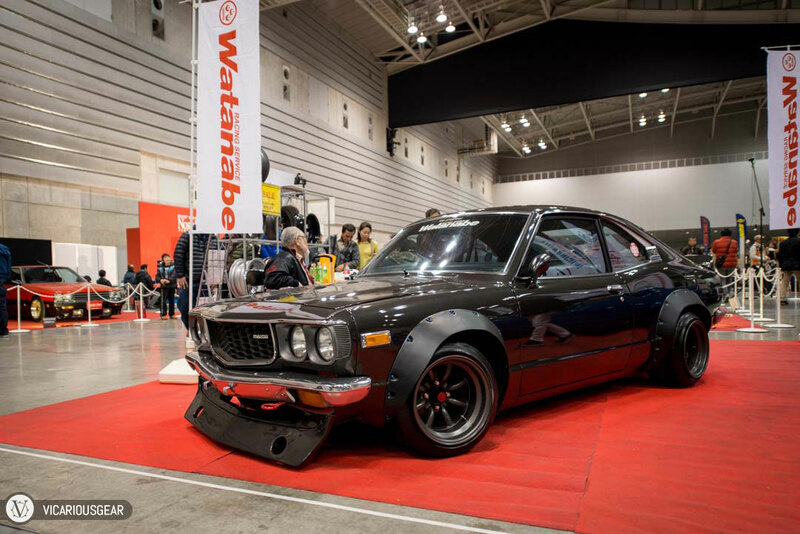 One of my favorite cars at the show was this black RX-3 at the RS Watanabe booth. 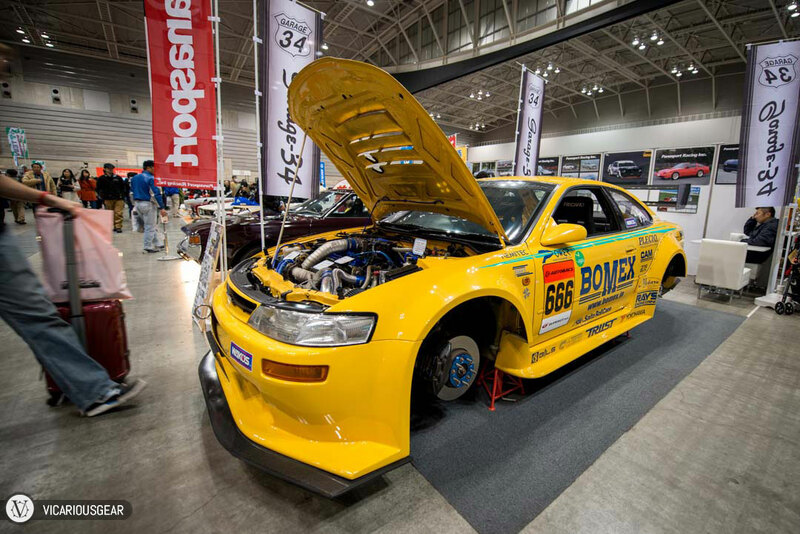 The ride height, huge flares and deep wheels just oozed a menacing presence. 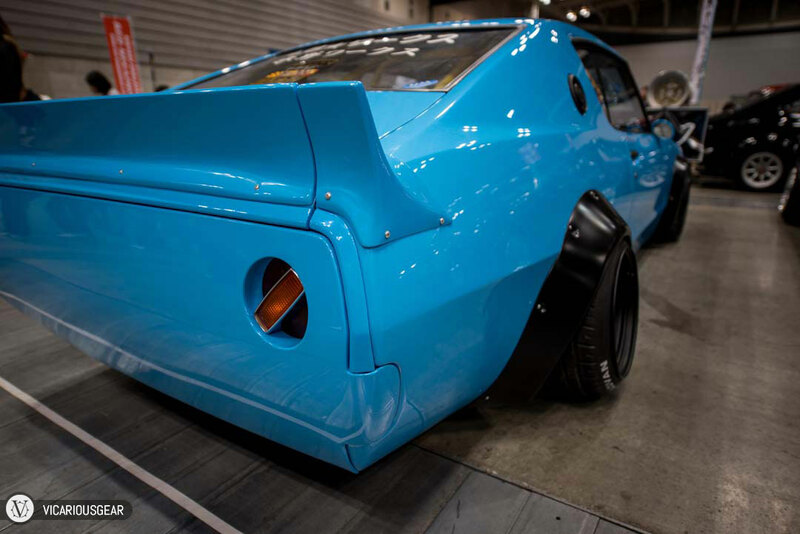 However, one thing I always found odd on the RX-3 design was the tail light housings. It still baffles me that they chose to use these huge plastic boxes to contain the light fixtures. 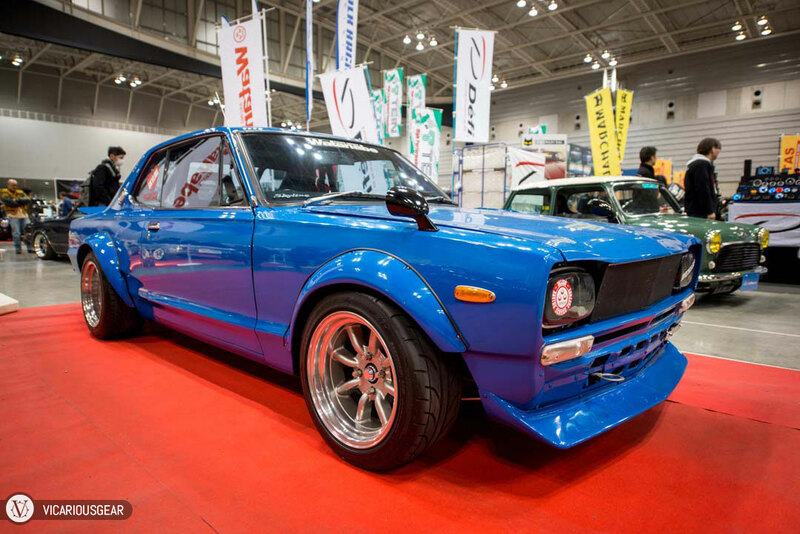 I love this shade of blue, just not on the Hakosuka. The whitewalls on this Honda Sports 360 really appealed to me for some reason. 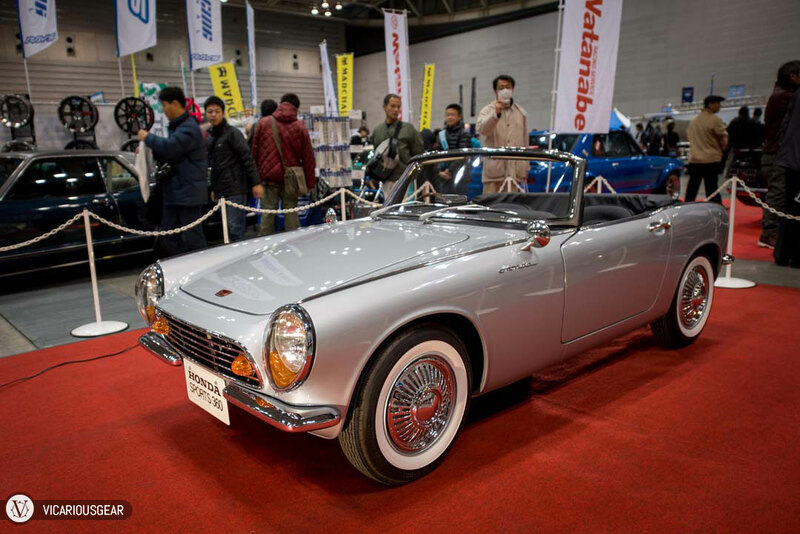 Seeing this really made me want a Honda S600 or S800 at some point in my life. 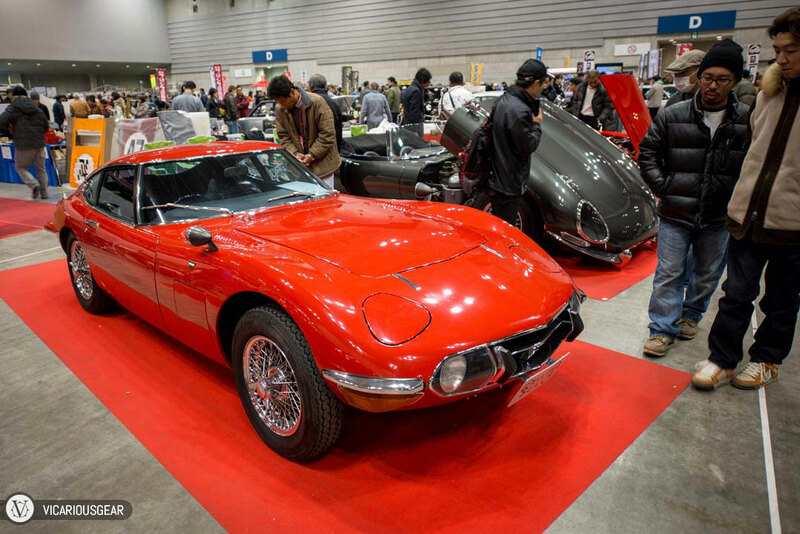 Just another pristine Toyota 2000GT. I couldn’t believe how many there were. 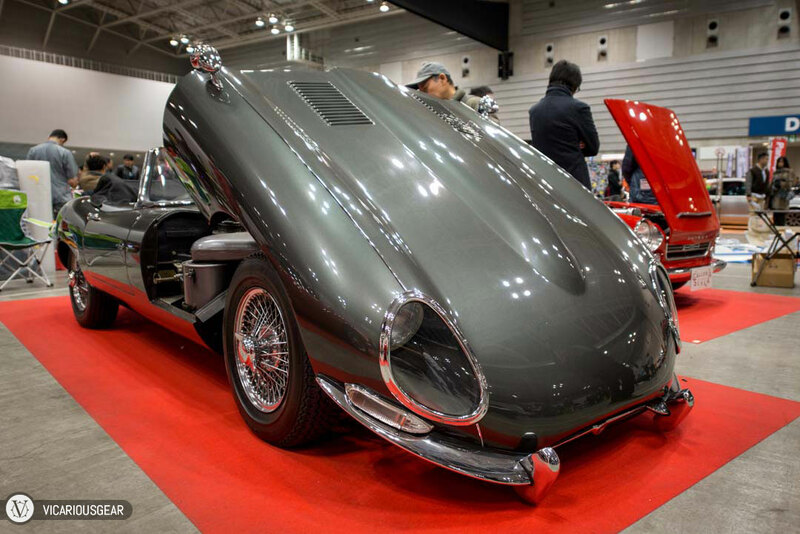 The hood on this Jaguar XKE convertible made a Viper’s seem small. 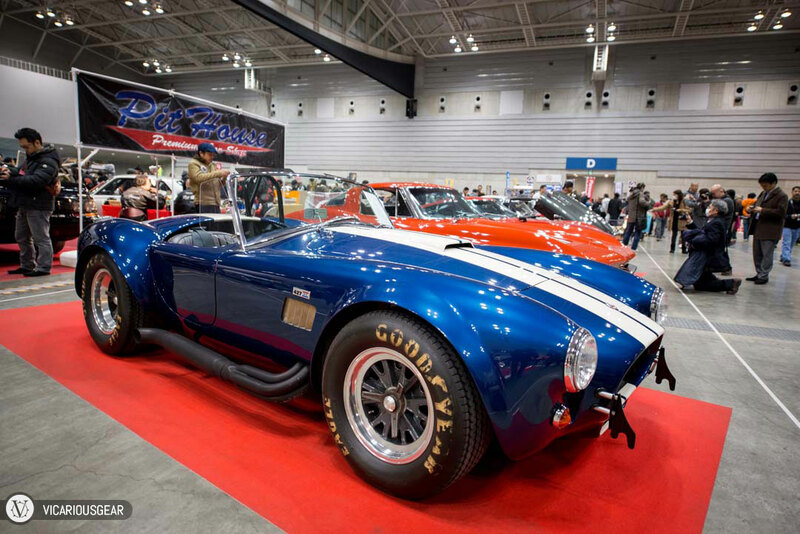 This Cobra had all the right parts. 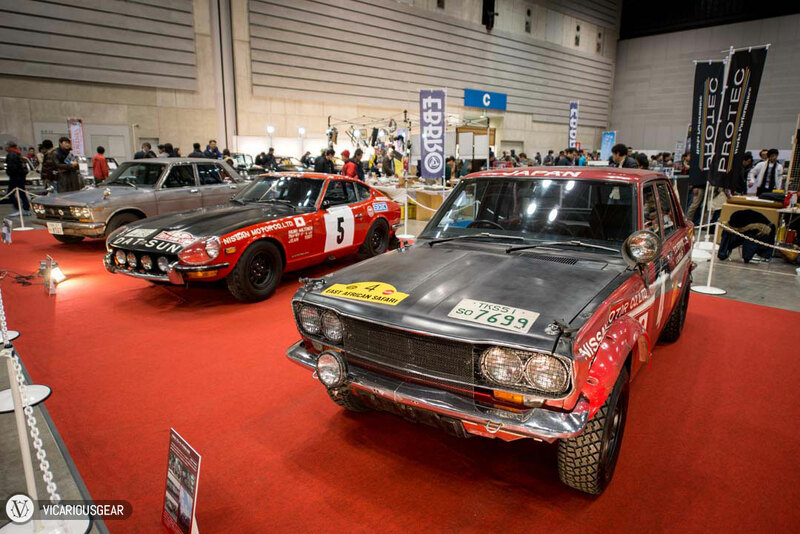 The Biko Works display had a handful of Hakosuka Coupes. They looked pretty good from 10 feet away but not so good upon closer inspection (This seems to be the case with all the cars I’ve encountered from this shop). 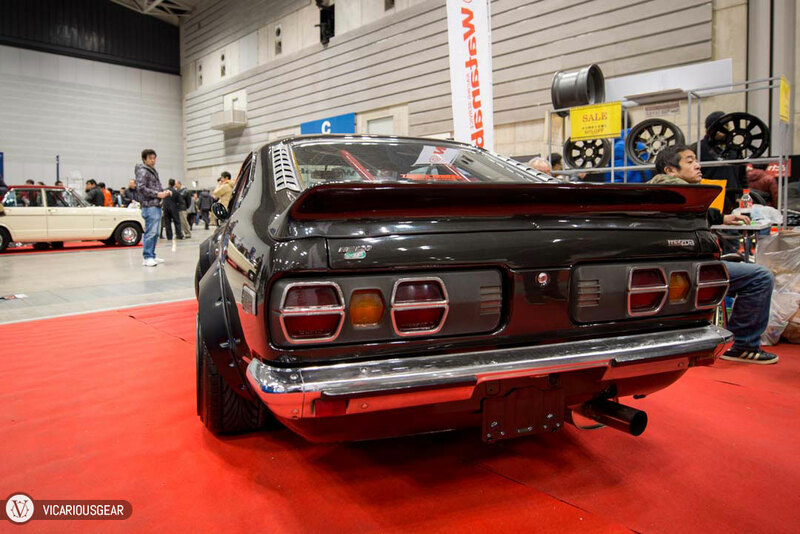 The low ride height of the Fairlady Z was a bit surprising. 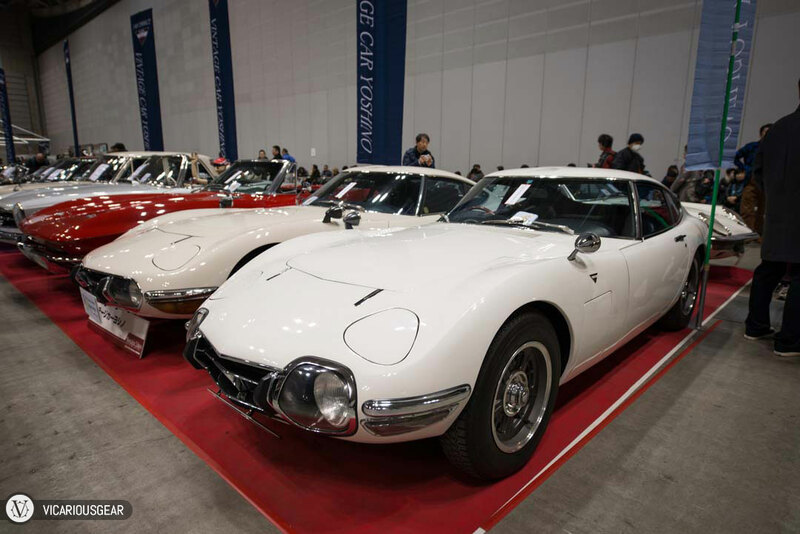 This stock Nissan 2000GT was probably one of the best deals at the show. 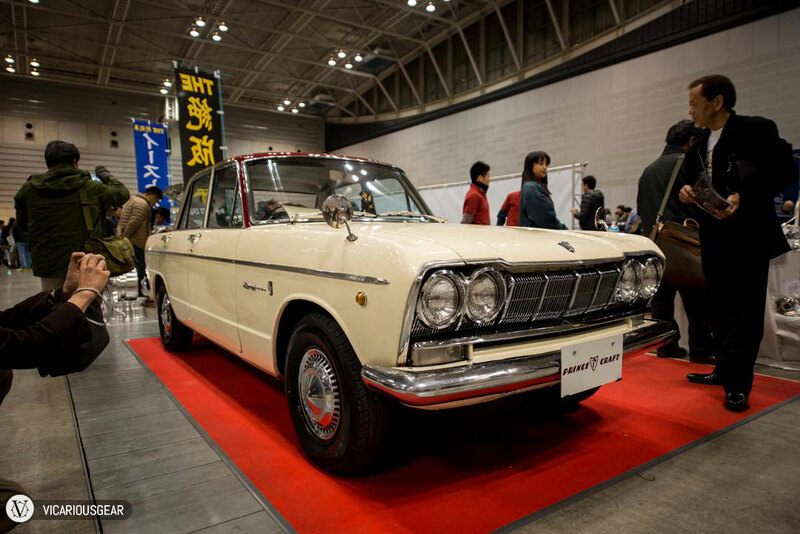 It is the best condition Hakosuka I’ve seen for less than 50,000 USD (and I’ve seen a ton). It was also refreshing to witness the factory surfline still intact. 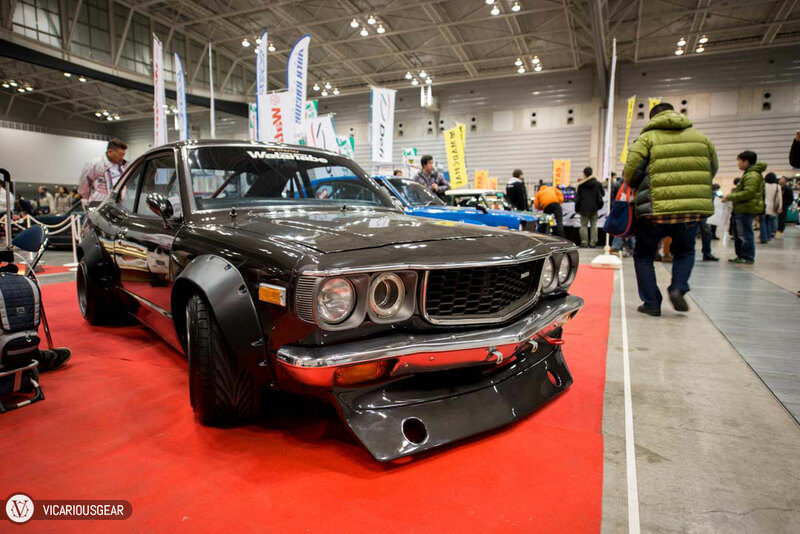 Undoubtedly the most aggressive AE101 Levin I’ve ever seen. 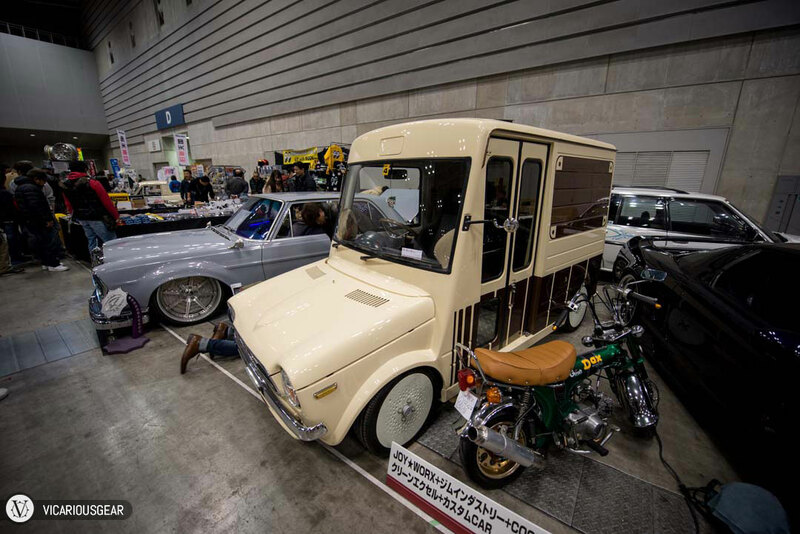 On the complete opposite end of the tuning spectrum from the AE101 was this panel van. The crazy proportions always make me smile. This would be an awesome truck to run errands in. 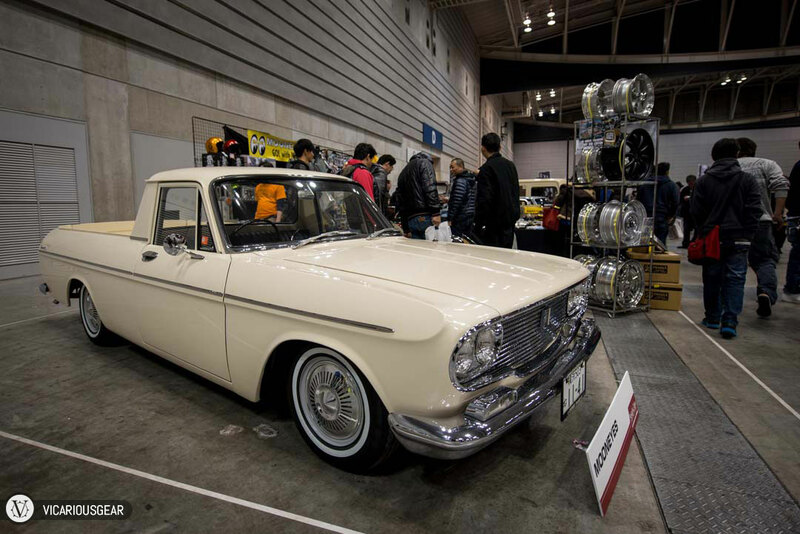 Mooneyes was asking somewhere around 50K USD for this Toyopet Masterline Coupe Utility. 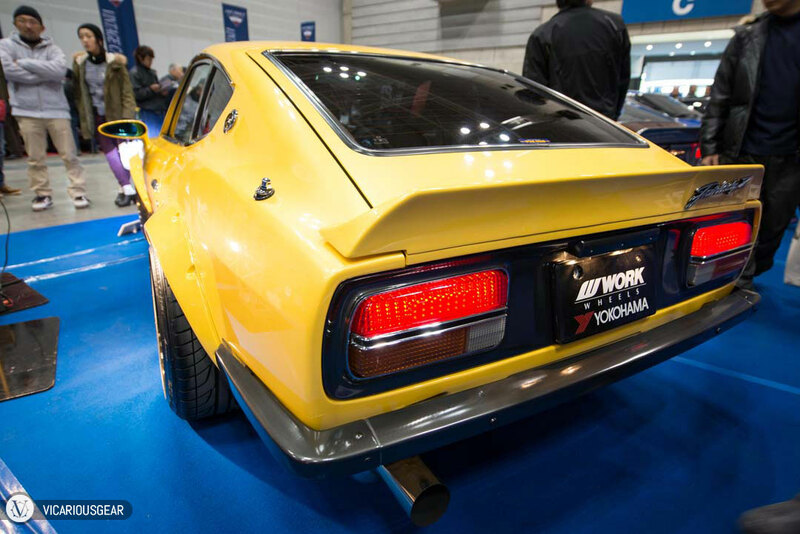 The rear end of the LB-Works / Mizuno Kenmeri. The new tail lights definitely fit the overall theme but I still prefer the look of the originals. 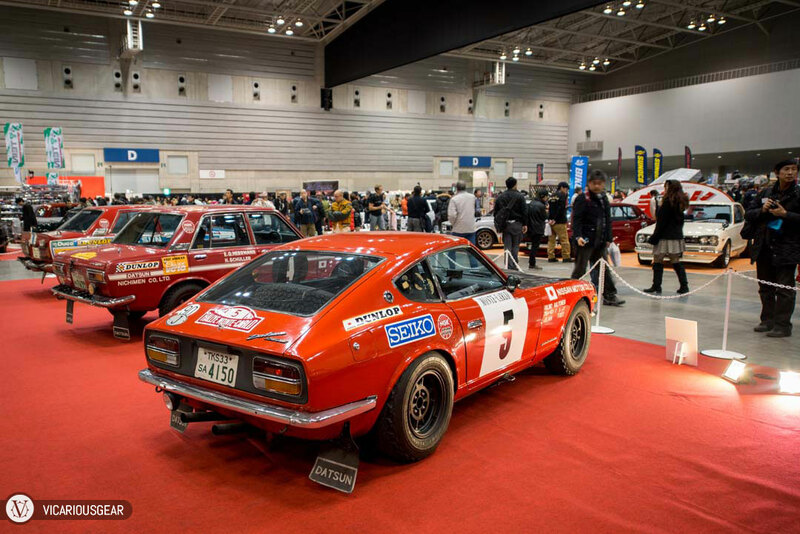 The Mazda Group S rally car that never made it to competition. 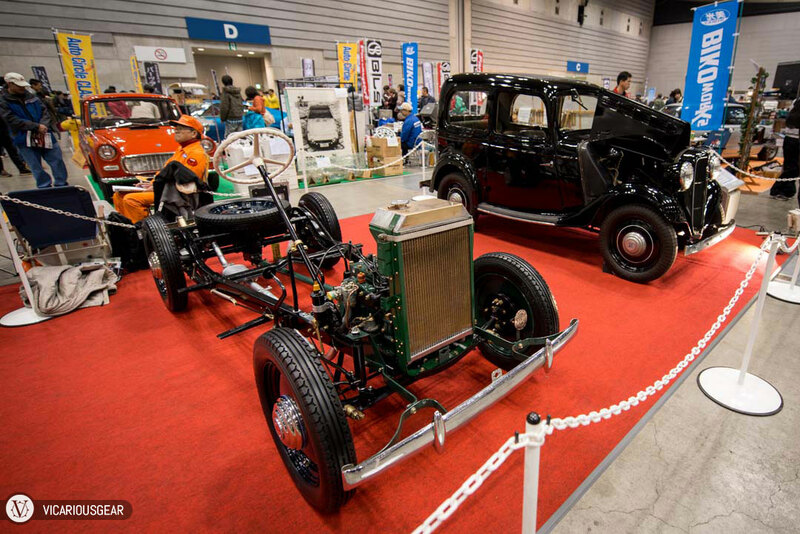 Seeing this 1930s Datsun 16 Sedan with spare frame and drivetrain was pretty incredible. The owner’s friend who was watching the booth was happy that Mimi was displaying some interest in it, so he invited us in for a closer look. 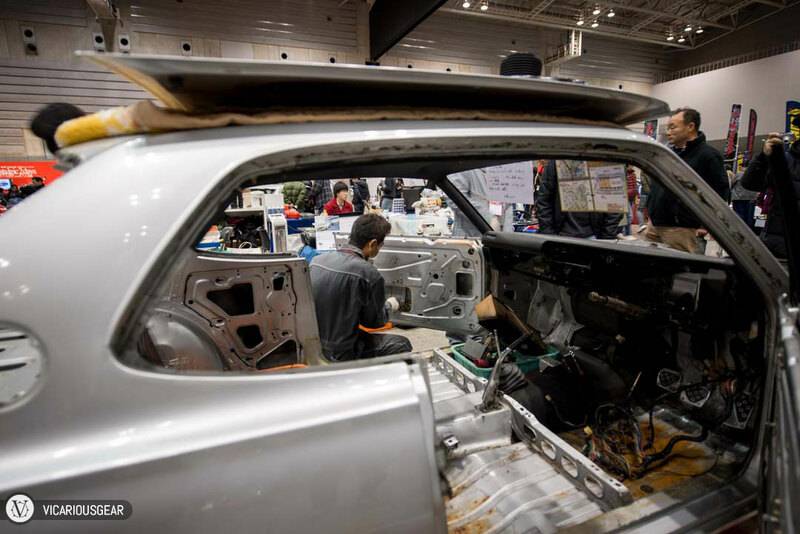 Next to the Datsun 16 was another shop reassembling a 2000GT in the middle of the show. 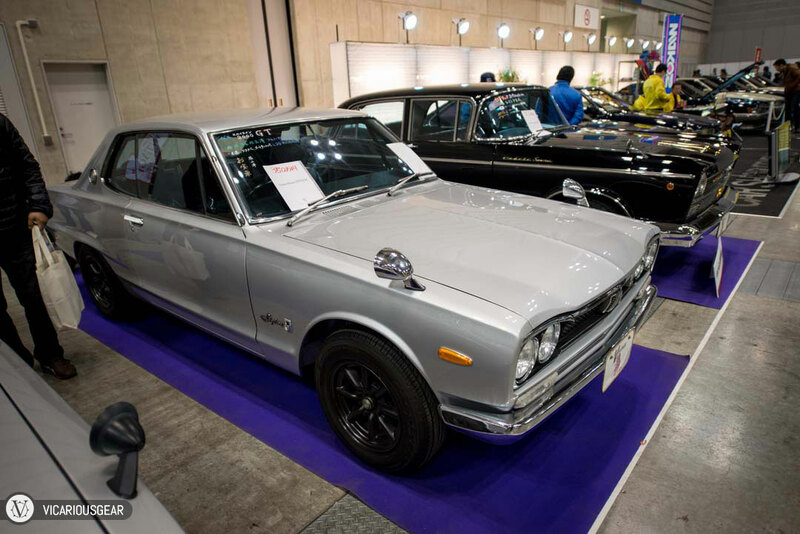 RS Start brought out two Skyline GT-Rs. 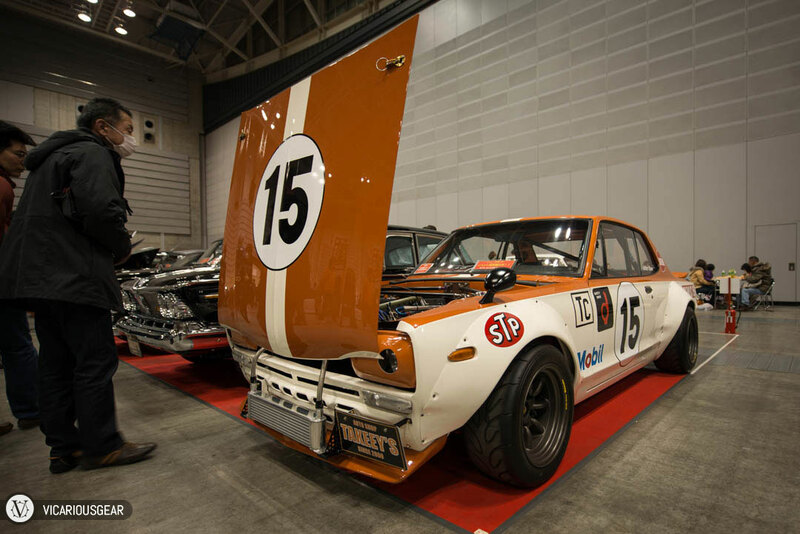 Nissan V51B (Skyline 1500 Van Deluxe) service car. 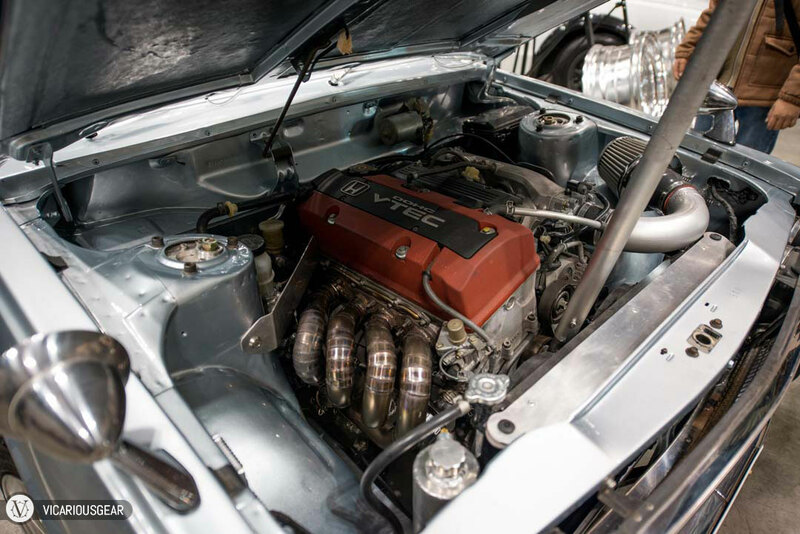 It may be a bit odd to see non matching engine bay paint on a 160,000 USD Farilady Z but it definitely made all the beautiful mechanical parts stand out. Their Hako has me considering 16inch wheels instead of 15s. 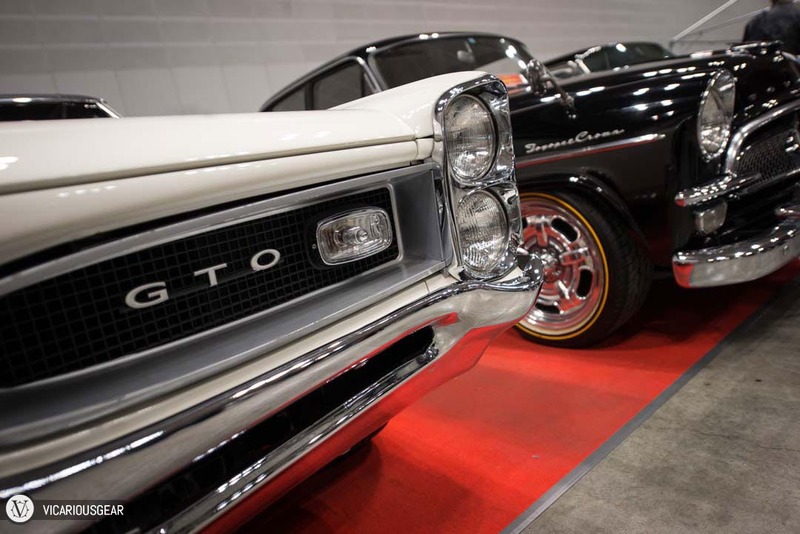 I chose to attend on Sunday because all the parts dealers would be set up. Protech had this gorgeous header on display. Fortunately it was for an S20 and wouldn’t fit my engine. 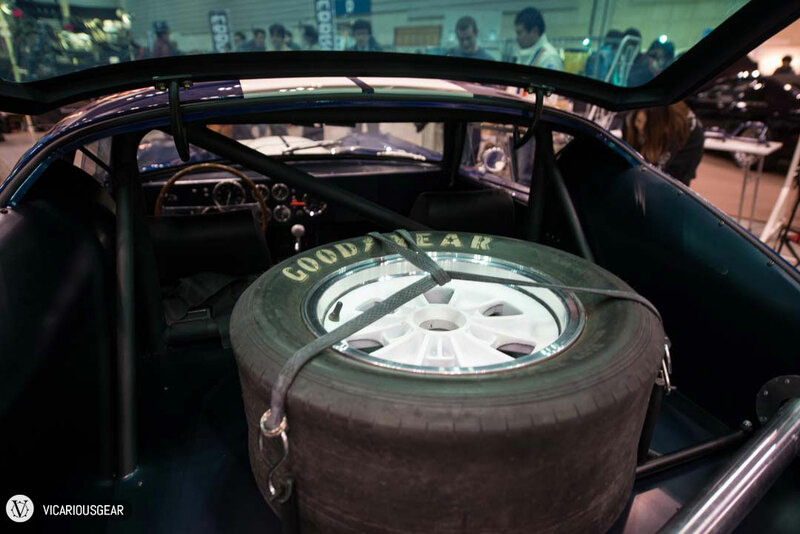 A pretty cool collection of F-1, kart and other racing wheels. All for sale. 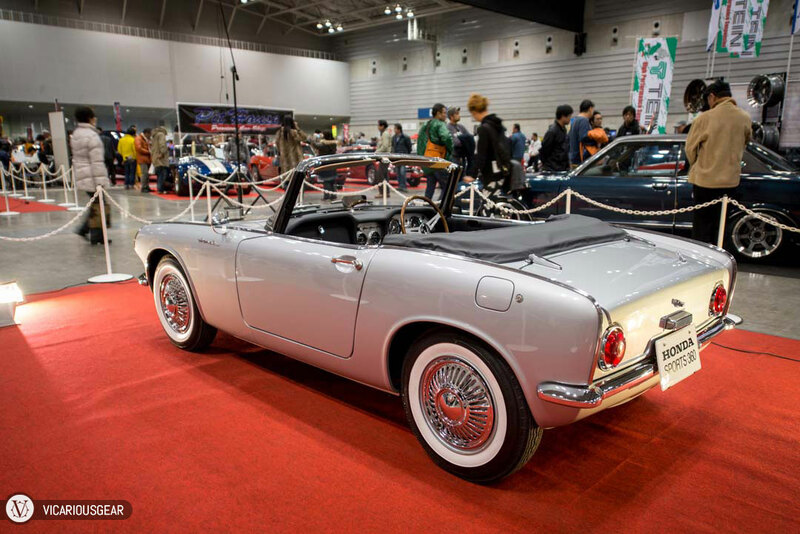 I don’t think any Japanese show would be complete without at least a few die cast models. 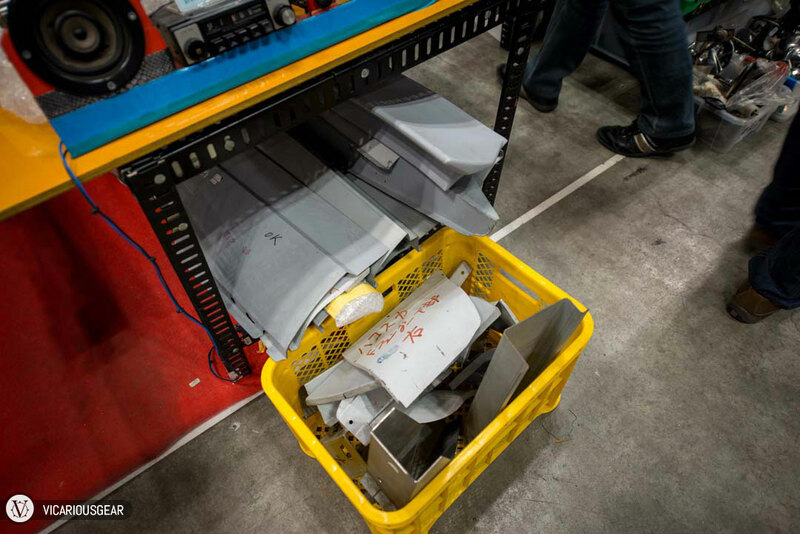 There were probably thousands littered throughout the booths. 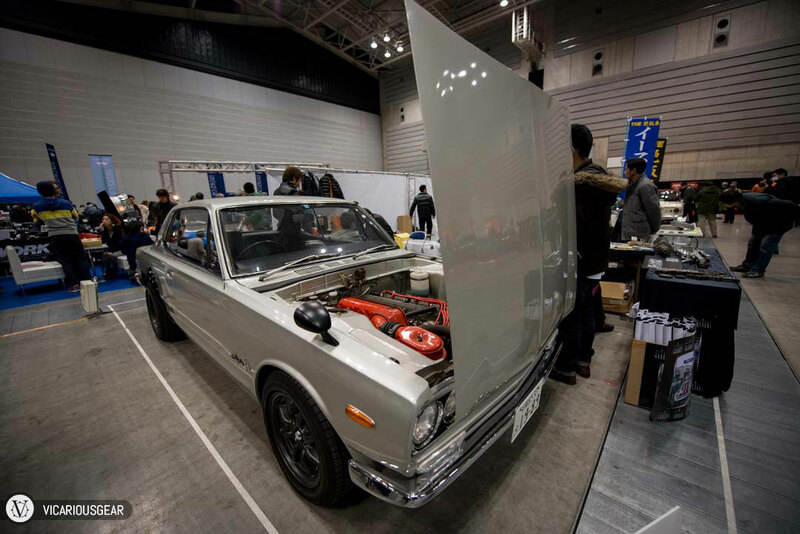 Simple metal restoration panels for all sorts of cars were available. Along with some composite reproductions of iconic pieces like the G-nose. 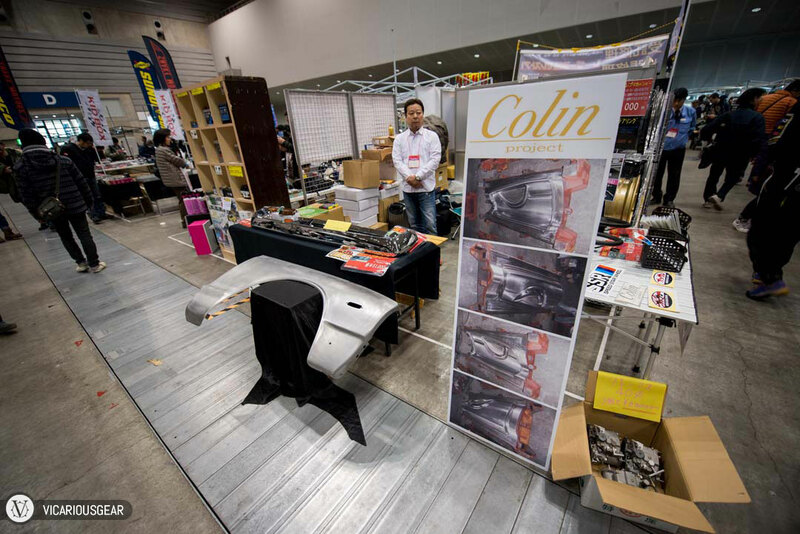 One booth that caught me completely off guard was Colin Project. 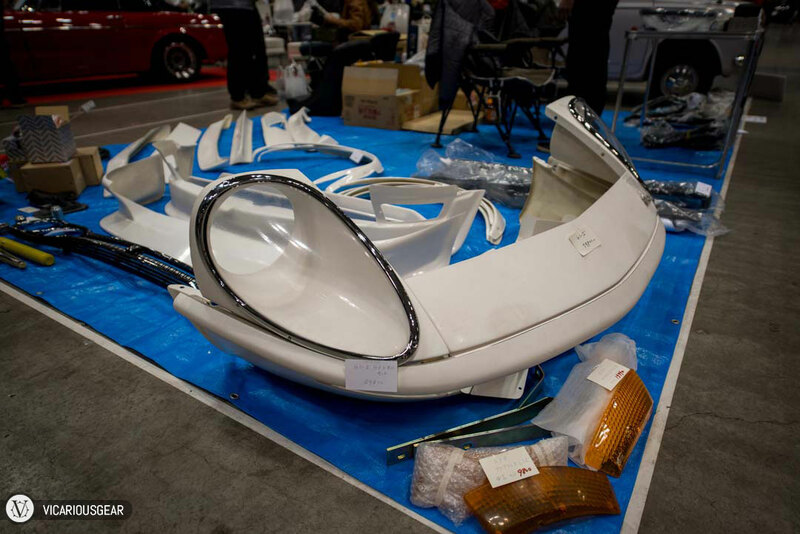 It looks like they have machined metal tooling for stamping new Hakosuka quarter panels and front fenders. 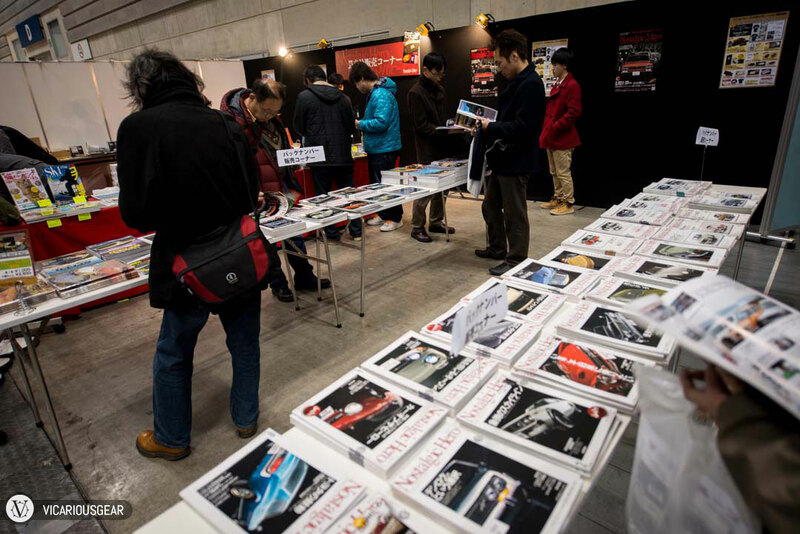 On the way out, Nostalgic Hero set up a booth full of back issues to thumb through. Mimi was getting hungry so I didn’t spend time thumbing through them. I have no regrets since we had a great time perusing all the actual cars there. ← Taroko Gorge. Hualien, Taiwan. 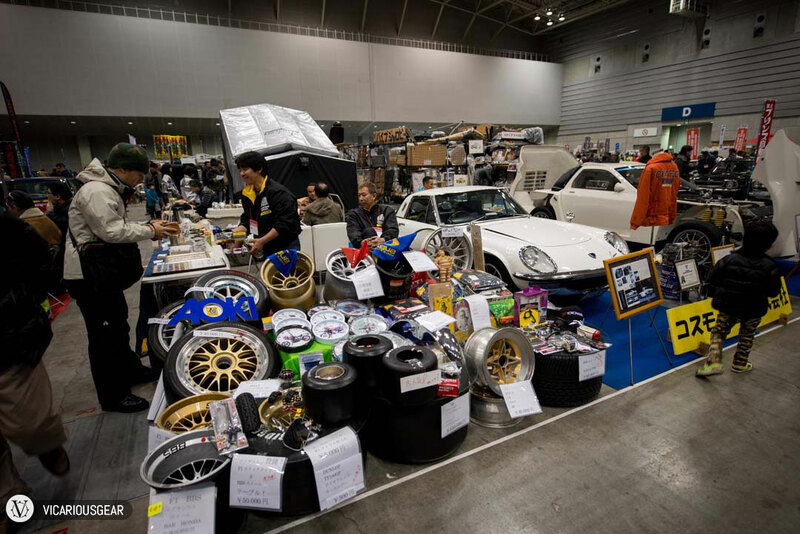 Any suggestions on vendors in Japan which are selling the above mentioned items?